Being in the first trimester of pregnancy has really taken a toll on my energy level. And, I did all that bad-mouthing about PMS?!! This is on a whole different level! So what do you do when you don’t feel like washing, detangling, conditioning, styling or even looking at your hair? I have been mistreating my strands terribly … not protecting it at night, sometimes not moisturizing because I AM DRAINED! Any tips on styles that will hold me over until I feel like dealing with my hair? Thank you! Okay, I have ABSOLUTELY no direct experience in this regard. So, you may have to take my advice with a grain of salt and accept it as what it is, the well-meaning suggestions of a layman … or woman, to be more precise. That disclaimer aside, here are a few styling options that I think might help get you through this tough time with minimal effort, while still allowing you to maintain the health of your hair. Medium to large twists or braids with extensions. Washing, conditioning and moisturizing will still be necessary, but with far less frequency and without the hassle of detangling. And, moisturizing is as simple as buying a leave-in conditioner or braid sheen spray to use every few days and then sealing with a light oil. This long-term protective style will make your day-to-day styling nominal. But, you still need to wear your satin bonnet or scarf at night and make certain that the braids/twists aren’t too tight or left in too long. Also, make certain to take a break between installs to give your scalp time to rest. This is always important to preserve one’s edges, but may be even more so during pregnancy as undue stress during this time may exacerbate postpartum shedding. Mini or small twists on your own hair. These won’t last as long as the same style done with extensions. However, they still work as an option that can last a week to two and eliminate daily styling. In regard to care, all of the above still applies. Wig it up! There are so many options and you can rock a different look every week if you like! You can cornrow your hair up for the week and rock a wig when out and about. Then, you release your cornrows once a week to every two weeks for wash day. Though you will have to detangle, the amount of time spent doing it will be far reduced as the cornrows will leave hair in a stretched state. I also found this blog post, Natural Hair While Pregnant and on Bed Rest (ignore the picture! *lol*). The author outlines her regimen, which revolved around keeping her hair in six large braids the majority of the time, washing her hair once every two weeks and wearing a braid out when it was necessary to venture out in public. As you’re not on bed rest, the need to go out is probably far more frequent. 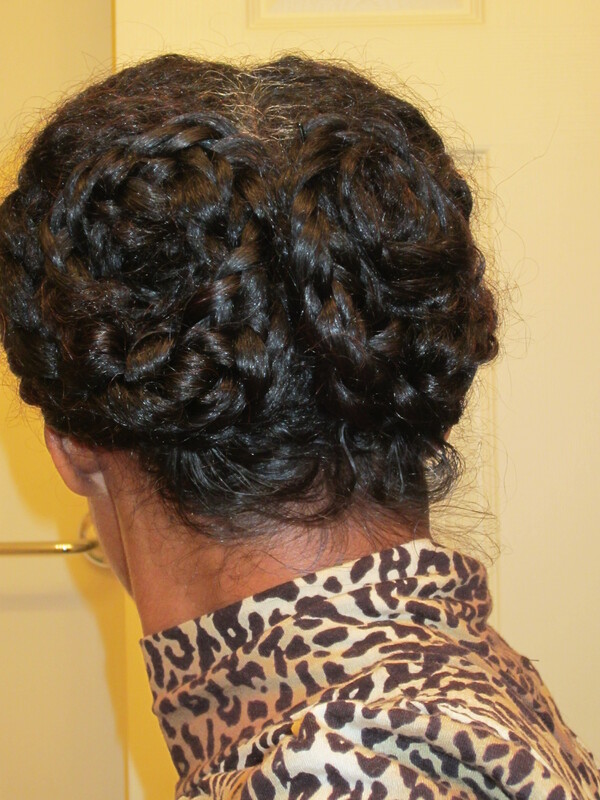 So, you might be able to wear a neater version of the 6 braid updo that I detailed here and save the braid out for special occasions, like date night. What styles have you worn during pregnancy that were easy on time and effort, without sacrificing the health of your hair? Buns are always my go to style – pre, post, and during pregnancy’s ( I had two back to back), I’d say bun its easy and I’ve seen a lot of length retention. Co-Wash, detangle, add leave in, use KCCC if you’re feeling fancy, let dry a little bit and then bun. At night spray a little oil (keep it by your bed, just in case you forget – I know how it is lol) and then loosely bun and hit the sack again. I’m not sure if you need “edge control”, but I also keep my scarf next to the oil so I could tie my front down. I wouldn’t come it much or at all during the week. Hope this helps. I was thinking buns too Terysa, but I didn’t know if that might be too much daily work for Chandra! *lol* I have to tend to reset my buns every couple of days, so didn’t know if that would be too much. Oh!! And the one other thing I should have said, is keep the bonnet/scarf under your pillow or stuff it in the pillowcase! That way, you never have to get back out of bed to get it! You get in bed and realize you forgot to put it on? Just pull it out with no effort:)!! You know me too well!!! Daily work+pregnancy= OH HECK NO!!! lol But that is the style that I have been wearing anyway. Just the washing, conditioning, and detangling is the part I don’t have the energy to do! I will definitely check out that website!! Thank you! Very helpful!!! I actually read through your blog yesterday and was like “Shoot, I should try that! !” Never thought about keeping supplies by the bed…Great idea!!! Thanks! I would have to say that I rocked buns while pregnant! This was especially true during my first and trimester as I fought 24 hr a day extreme nausea. Toiling with my hair was the furtherest thing on my mind. Pregnancy is also a great time to call out all the girlfriends. Girlfriends make great hair stylists….routinely my girlfriends would detangle, wash, condish and re-bun my hair. Shelli – you’ve given me a great tip. I routinely lose my scarf. It seems to vanish as morning approaches. The thought never occurred to me to stuff it in my pillowcase. Who knew! Thanks! This is all great advice. I am pregnant with our 3rd child and ponytails have always done the trick. I keep the eyebrow and earring game tight in case I want to spruce things up with a little makeup. I suffered from nausea too. I am in my 13th week and it is starting to let up some. I recently bought those Preggie Pop Drops (from Motherhood Maternity) and they helped alot. Also chewing gum. Right now I’m wearing the Seabands around my wrists. They apply pressure to certain spots on your inner wrists that is supposed to help with motion sickness, nausea, etc….Seems to work. What really works for me is to just sleep it off but I can’t sleep 24 hours a day! Hope that helps! Unfortunately, my “morning sickness” was so bad (dehydration et al) that I had to have IV fluids and meds (Zofran) all the way through the third tri with baby #1. Baby #2 was not nearly as bad. I had 24 hr morning sickness but learned to cope. I nimbled all day. No large meals. No fatty foods. I seemed to tolerate salty foods like watermelon w/salt (yucky, right)? The nutritionist advised to eat dried papaya and ginger to calm the nausea; it helped. I’m taking notes on all of this!!! Lord, y’all may have to come take care of me with all this mess! Shelli you might be lucky!! I only had nausea for the first few weeks with my first child. They say every pregnancy is different! A lady at work gave me “Wheat Germ”, I’m very finnicky about food that looks weird let alone sounds weird. Wheats + Germs + No ma’am!!! Some people swear by it though, not ya girl. Thanks for all the tips! Like I said this is baby no. 3 and I am still learning. Anything that was overly sweet (eg Mom pops) sent me swirling (in a very bad way). The watermelon keep me well-hydrated and the salt quelled my nausea for some strange reason. By the third tri, I was able to add Little Caesar’s cheese pizza slices to my diet. I ate pizza slices and watermelon w/salt daily. It was literally all I could keep down. My baby arrived three weeks early and was a health 7# 1oz. If she would have stayed in any longer, she would have been over 8#…..
Each and every pregnancy is different. Hang in there! What’s truly amazing is the pregnancy journey can be “pretty ugly” (oxymoron), but once the beautiful baby arrives; all the misery of 24 hr/day nausea fades to black! Best to you and happy holidays! Yup … I put my PJs there sometimes too!! LOL! !